Bringing ‘Robotix’ into the classroom! Wall-E, the endearing robot in the Pixar movie of the same name, was the result of computer generated graphics. Imagine trying to bring him to life! C.N.S. Chaitanya, a student of class 11, says his interest in robotics was also sparked by the many robots he had watched in movies. Though he hasn’t built any robots so far, Chaitanya would like to build ones that are capable of quick responses in case of disasters. How does one learn about robotics? 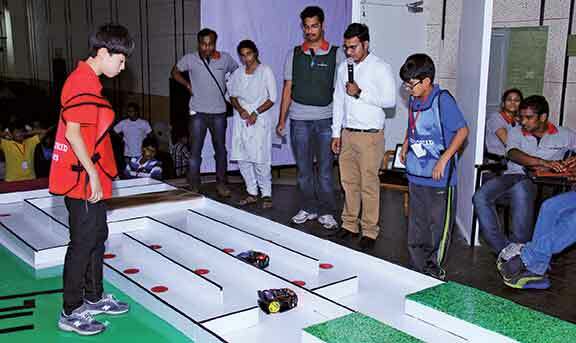 Chaitanya participated in a training session of the ‘Robokid 2013’,a National Level Robotics Competition for school students, organized by Jay Robotix – a multi -dimensional robotics firm in India. He says, “The training provided by the organizers was very helpful as it taught us to program a robot using RoboGuru.” The software, RoboGuru, developed by the same firm, is an easy-to-learn programming software on which a student can program robots without the need to know in-depth coding or any other programming language. Its easy interface was designed keeping in mind the needs of students as young as those in class 6. A robotics enthusiast himself, Mr. Sudhir Reddy dreamed of building robots which would work in collaboration with humans in day-to-day activities and of encouraging others to learn about and build their own robots. With over 8 years of experience and expertise in designing and manufacturing many complex and task-specific industrial robots, he founded Jay Robotix in 2010 in order to turn his dream into reality. Apart from the Robokid competition, his firm also organizes training workshops and camps during the summer and winter breaks to promote awareness in the field of robotics and encourage “practical learning” amongst students from schools and colleges. For those that want to integrate robotics into the curriculum, Jay Robotix has developed an activity based learning (ABL) laboratory called RoboLab. The schools are provided with robot kits and the curriculum is modified to make space for activities and projects which will not only help children better understand subjects like science and mathematics by providing them with the opportunity for experiential learning but also improve design and organization skills and learn about team work. Nachiketh, another student from class 8, learned the basics of mechanics from his teacher and has since been scouring the Internet for resources on building electronic devices and robots. About his experience in the Robokid competition, Nachiketh says, “We learnt a lot about robotics during the competition as the RoboGuru software is made in such a way that it feels like it is a virtual game although at the same time we are doing intense programming. The cool part was that we can put this code on a real robot!”Nachiketh has built 7 robots so far and hopes to build a humanoid and an autonomous (self-driving) car in the future. From an education system that depended solely on textbooks, the focus over the years has gradually been shifting. In today’s fast-paced tech world with programming, innovation and technology coming to the fore what better way for students to learn about technology and its possible impacts than to be involved in the process – right from creation to execution? In the movie, Wall-E was designed to clean up a waste-covered Earth. By enabling hands-on development of robots, students will not only get a taste for real-world programming and technology development but also get a better sense of what can be made possible! If your students are interested in building their own robots, the registration for the 2014 Robokid competition is open. For information about ROBOKID 2014 Competition log on to www.jayrobotix.co.in.